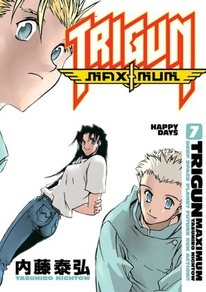 Unlike the subtitle of this new installment of Trigun Maximum, our hero, Vash the Stampede isn't exactly experiencing the happiest of days. Rather, his struggle with his brother-in-destruction, Knives, is escalating to extreme heights. But wait, before we get to the frantic action, creator Yasuhiro Nightow would like readers to know about these boys' mysterious pasts, and uses almost half of this issue presenting the lives of the two supermen before they fell to the dusty planet.